This is a simple dish, just heat a little oil, add some minced garlic and cook until fragrant. 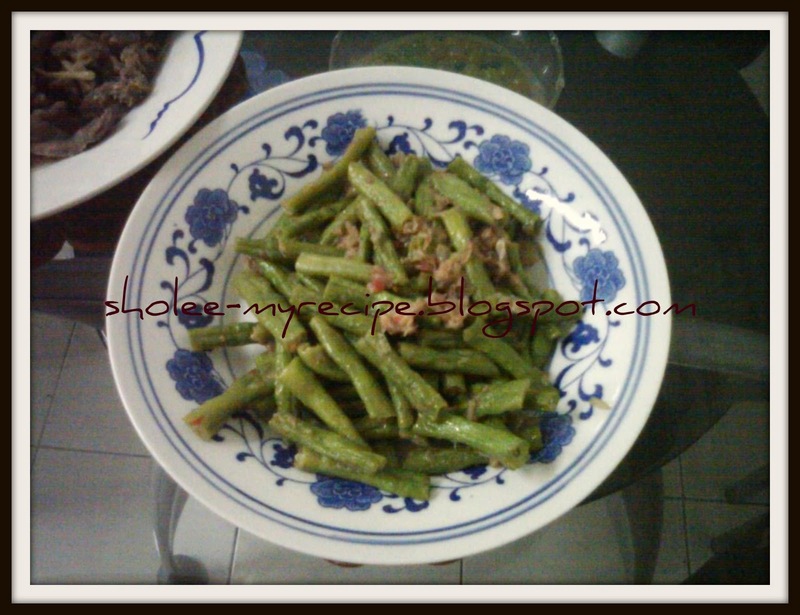 Add cut long beans and stir fry until half cook. Add cincaluk and stir fry until long beans are cooked. 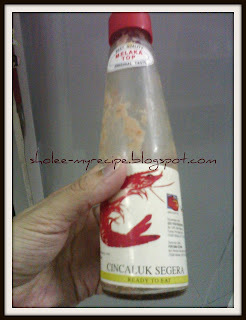 Cincaluk is a famous Malaccan sauce made from prawns, chili, onions and lime (according to the label). It's really nice and can be used like chili sauce. Cincaluk is an extremely salty, fishy and pungent concoction of teeny tiny shrimps fermented in brine and cooked ground rice. Don't be spooked by the little black eyes dotting the pale pink bodies of the shrimp. It’s all edible. You can use cincaluk straight out of the bottle, mixed with sliced chilies, onions and a squeeze of lime as a condiment (especially popular with grills). It's also used to flavor many dishes and stir-fries. Because it's so potent, a little goes a long way. Fermented shrimp has been found to yield potent natural anti-oxidants, EPA, DHA and amino acids. Some scientists have also started using cincaluk to cultivate and produce probiotic lactic acid bacteria.